Ok, I know it is May. That in theory, this is Springtime. I say “in theory” because I am still freezing, wearing a coat, and wanting to eat hot soup. I say, if it is going to be winter eight months out of the year, we ought to have Christmas twice. At least. And how about we just pretend that I did not fall off the blogging planet for six months, ok? For Christmas last year we got to go pick up our daughter, who was enjoying a semester abroad in London. I know weather-wise that December is not the best time to be traveling to London, but we were able to enjoy unseasonably mild weather and only had to deal with rain a couple of days. For the rest of the time the sun was shining, with highs in the upper 40s. Being from the Tundra, this was no problem at all. For us Polar Bears. Plus, we got the added bonus of seeing London at Christmas, which was phenomenal. This Brits sure know how to do Christmas! 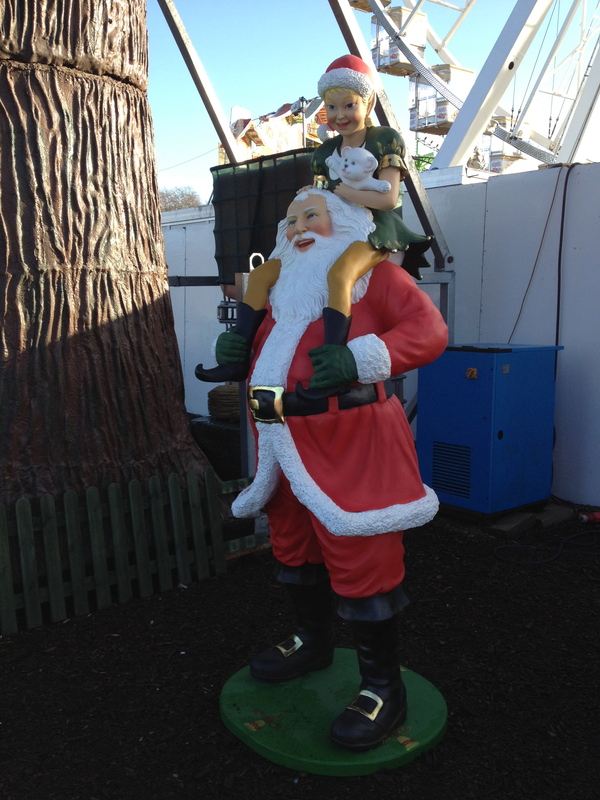 In another post I will write about all my Christmas activities, but this activity, visiting the Hyde Park Christmas Wonderland, really deserves a post of its own. Want to know why? Because it is just about the coolest, creepiest, eclectic little festival I have ever attended. How to describe it? Let’s see–How about: State Fair + Dickens + Wienerschnitzel + Something Wicked this Way Comes + Circus. Oh yeah. And Christmas. I don’t believe there is an equivalent in the US. First of all, you are greeted by this tree. 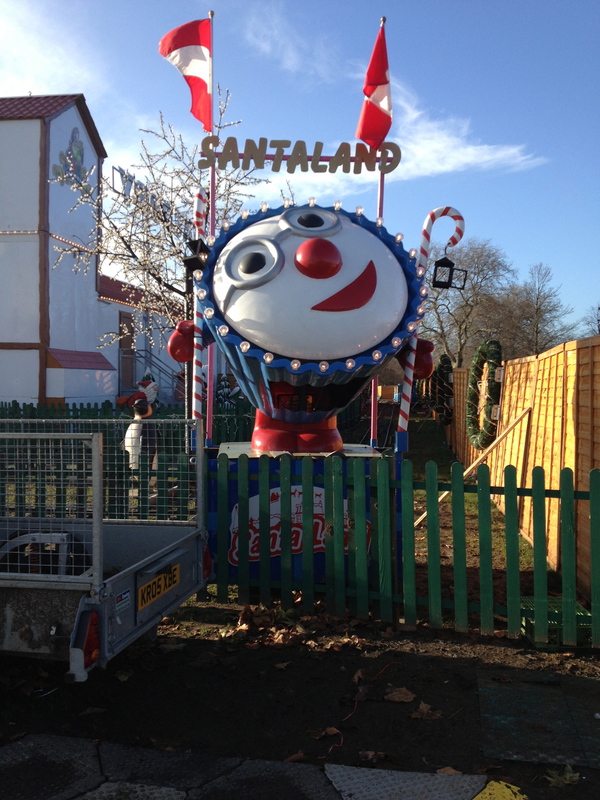 He talks in a scary voice, and welcomes you to enjoy the Christmas Winter Wonderland. You won’t hear a “Ho, Ho, Ho” out of this guy. I kept giggling the whole time I was listening to this grim welcoming little speech. There were amusement park rides (the State Fair/Circus angle) complete with Michael Jackson soundtracks (Christmas? 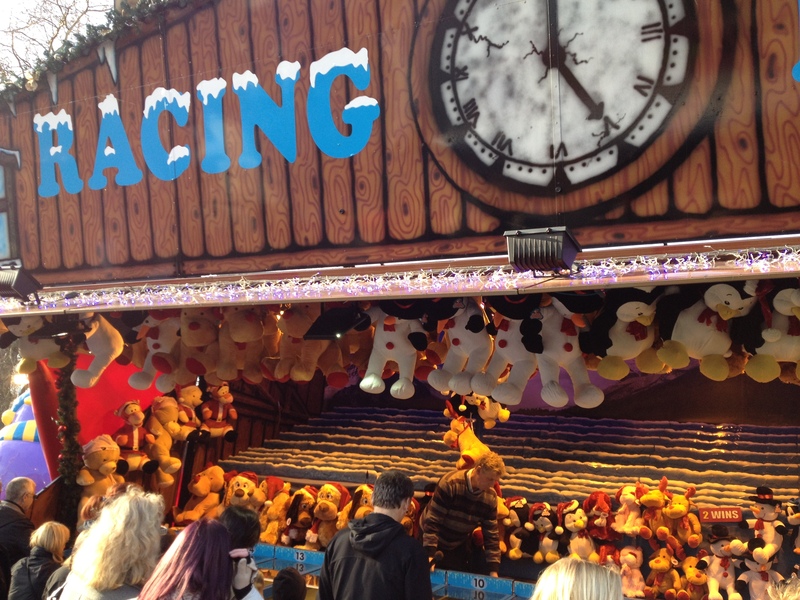 ), as well as carnival games. 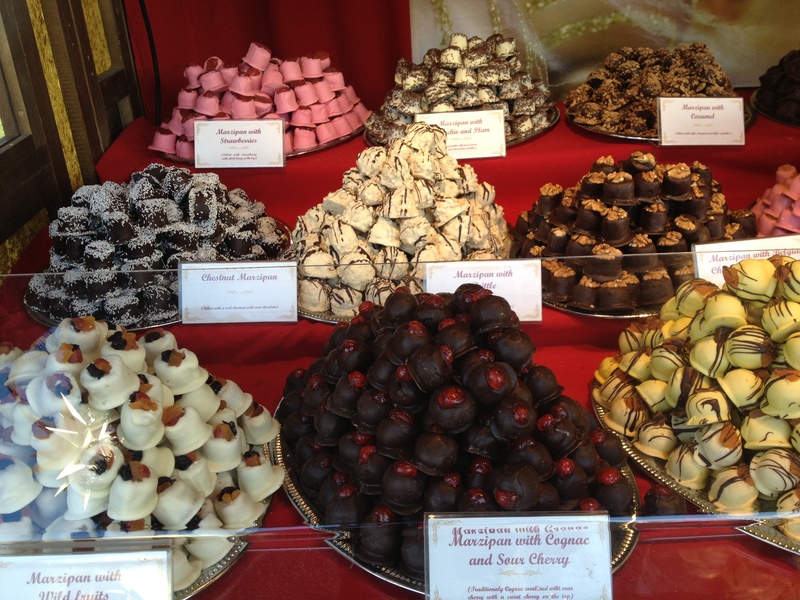 I couldn’t get over this little shop and their mountains of marzipan. We got several to try. Lucky me! I happen to adore marzipan. It seems to be a “you either love it or hate it” kind of culinary delight. 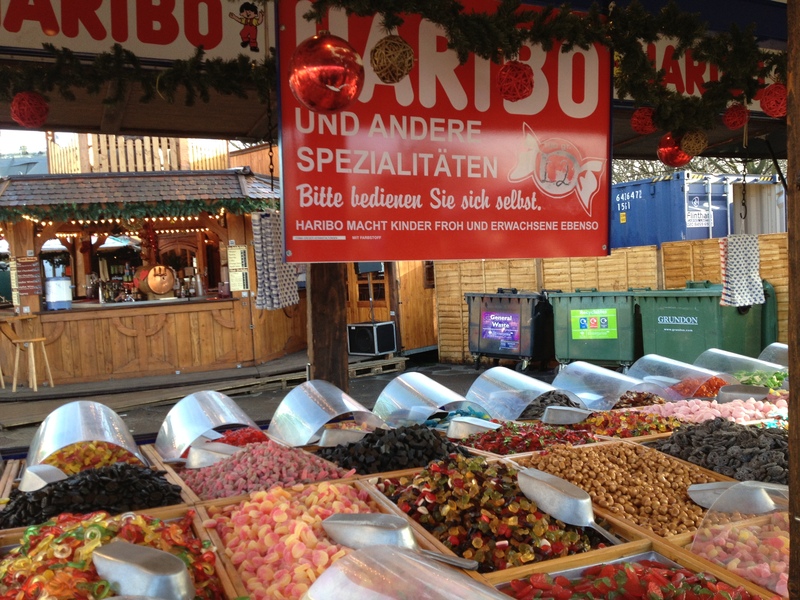 There was also a vendor who sported mounds and mounds of gummy candies–every kind you could possibly imagine. 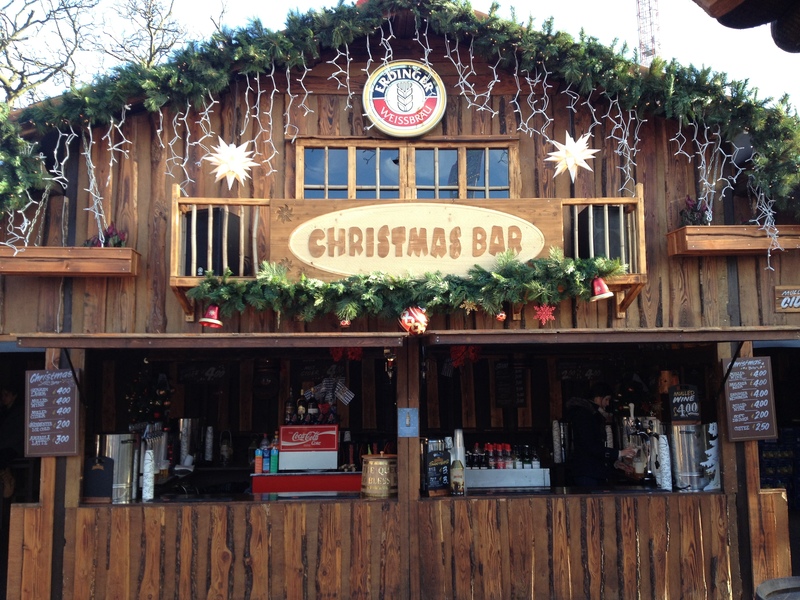 Of course, no Christmas festival is complete without a bar. Apparently. Notice the German element? I was surprised not to see yodelers with lederhosen. To round out our nice visit, we stopped at a place called the Jolly Hog. Well, just because. 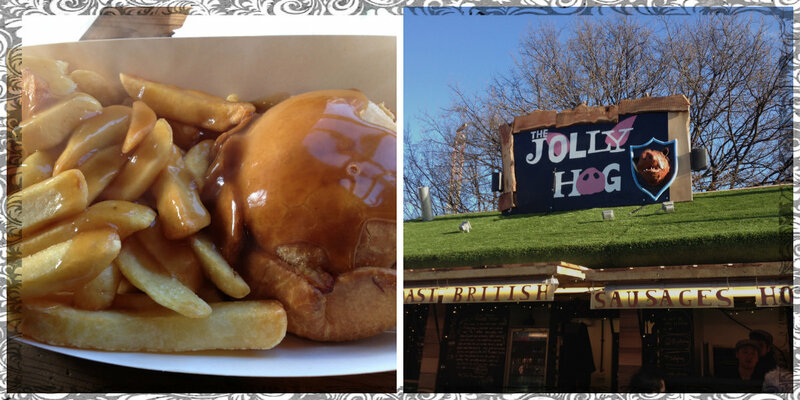 Because I wanted to be able to say that I ate somewhere called the Jolly Hog. We shared some piping fresh meat pies and chips, all slathered in gravy. Remember–you eat chips with a fork in the UK. There were many little shops and funky reminders of the Christmas theme. I thought it was a unique place to visit. It gave us some good laughs and a bit of incredulity, but isn’t that one of the great things about travel? 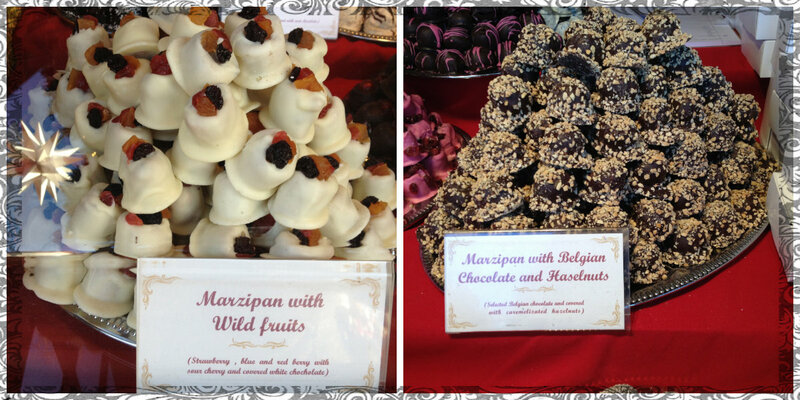 And that marzipan……can’t beat that. The Winter Wonderland usually begins in November and goes through Christmas. Here is the Winter Wonderland website. If you are traveling during the holidays, I would say this is a place not to miss. You were lucky to get good weather, it has been a horrible wet winter in Europe. Yes, we could not believe our luck, but it really was lovely.